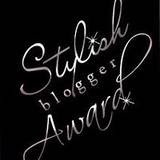 Simply Cute...: It's time to get spookyliciousss!!! It's time to get spookyliciousss!!! 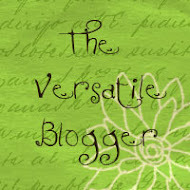 I am going to load lots of pictures this time. Let's get started! 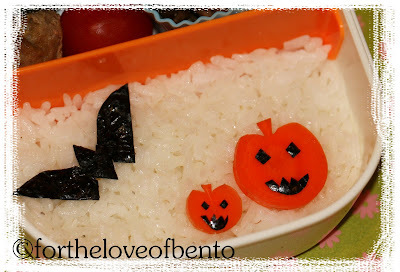 I pack a very thin layer of steamed rice for B, and I made the pumpkins from carrots, I use nori for the face and the bat. 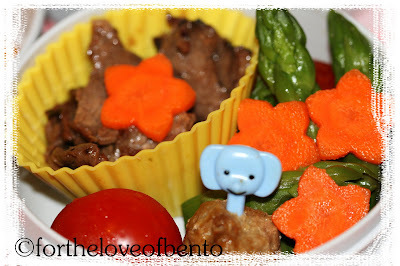 For the side dish I put some beef teriyaki and one piece of teriyaki meatball in a tiger food picks. Next to it are some fresh cherry tomatoes, steamed asparagus and some fresh flower carrots. This is the picture all together. I also pack him some fresh apples and gold fish for the snack time. 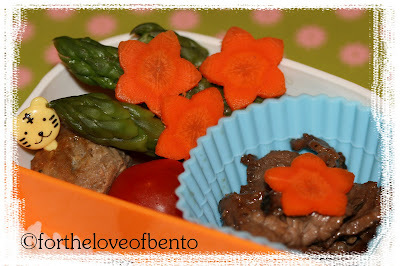 The menu is exactly the same with the one for B, only I packed it in a Zojirushi bento box. 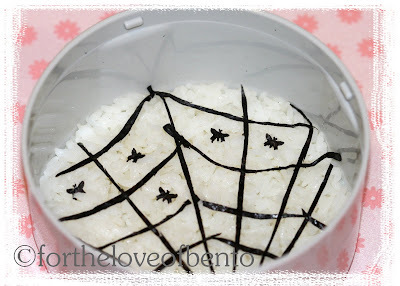 So instead of making the same pumpkins and a bat, I made him spider web using nori. My next Halloween bento is just a sandwich, I pack 2 different sandwiches, chicken sandwich for D and PB&J for B. B keep requesting me to pack him a PB&J sandwich, he probably sees some other kids at school having that. This is actually the first time I have a peanut butter after GOSH! like 7 years or so? we never have peanut butter since we knew D is allergic to peanut. I was so worry that he would be bothered by the smell but thanks God he seems to be fine. I was very carefull using the utensil and make sure D is not expose to it. So anyway ... no biggy ... it’s just a sandwich, it would not be too long to prepare. Let me start with the chicken sandwich one, I use a provolone cheese to make cute little ghosts and use some nori for the face. I wasn't quite happy with the result because the cheese on top of a whole grain white bread is not really visible enough. So next time I'll use whole wheat bread instead. The letter BOO is made out of some fresh carrots. Not bad huh? Next to the sandwich is some steamed asparagus, sweet corn, fresh sliced cucumber and cherry tomatoes. 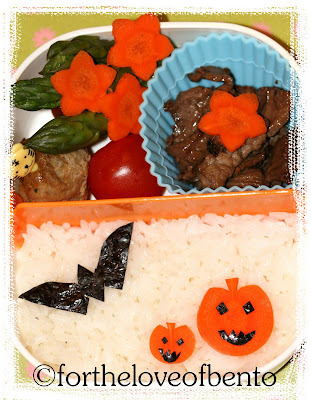 Okay friends, enough for now, more halloween bento to come!